Create your username. Your username is used to login to your site and can only include lower case letters and numbers with no spaces. Create a strong password that is at least 8 characters and includes upper and lower case letters, numbers and symbols. The URL prefix must be at least 4 lowercase letters or numbers. No spaces or special characters. You will not be able to change your URL after membership setup. Only enter the URL prefix here. The name you enter here will display next to articles that you share to social media. It can be multiple words and can include capital letters and spaces. For example, The Health Enthusiast. Select any and all categories that fit your business services. To select more than one, hold the Ctrl key until you are finished making your selections. Our sister company, Using Essential Oils, LLC. has created 13 courses for CoursePress Pro and has made them available to us to install on sites certified by doTERRA. We will install and set-up all 13 courses for a nominal fee of $50. Are you interested in having the doTERRA courses added to your site? You will not purchase the set-up until after your site is doTERRA certified. Do you have another business website or blog? Select any of the focus areas below of your business service/products. In addition to posting to your own blog, you may submit your blog posts to our, Vitality Advocates Community site and content distribution network regarding all things vital. Would you like to auto submit the articles you post on your personal member site to be considered for publishing on the Community Site? VitalityAdvocates.com is a web platform designed and developed by Vitality Toolbox, LLC for health and wellness advocates and professionals to jump start and accelerate their businesses by providing a professional presence on the Internet that helps them reach and stay connected to their customers by providing them digital tools to facilitate lead capture, blogging and interactivity with their internet visitors. Vitality Toolbox, LLC is an independent subscription based digital membership template provider and is not affiliated, or a joint venture with, any other company. Please read this Agreement carefully before signing up for your VitalityAdvocates.com membership site. By registering and signing up for a membership site, you agree to become bound by the terms and conditions of this agreement. If you do not agree to all the terms and conditions of this agreement, then you may not sign up for a membership site. This Statement of Rights and Responsibilities derives from the VitalityAdvocates.com and Vitality Toolbox, LLC terms of service agreement. The terms of service agreement is a body of principles that manages our relationship and expectations with those who interact with VitalityAdvocates.com and Vitality Toolbox, LLC. VitalityAdvocates.com is a fee based internet membership site hosting / blogging service that offers paid upgrades for advanced features such as extra storage and premium content and functionality. You are personally responsible for whatever you publish and you agree and acknowledge that VitalityAdvocates.com and Vitality Toolbox, LLC will not be held liable or responsible for your actions. In particular, make sure that none of the prohibited items listed below appear on your site or get linked to/from your site (such as spam, viruses, pornographic and hate content). By interacting with and/or using VitalityAdvocates.com, as a subscriber or interested party, you agree to this statement. 2. Your VitalityAdvocates.com Account and Site. You are responsible for maintaining the security of your account, member site and blog, and you are fully responsible for all activities that occur under the account and any other actions taken in connection with it. You must not describe or assign keywords to your blog in a misleading or unlawful manner, including in a manner intended to trade on the name or reputation of others. VitalityAdvocates.com may change or remove any description or keyword that it considers inappropriate or unlawful, or otherwise likely to cause VitalityAdvocates.com liability. You must immediately notify VitalityAdvocates.com of any unauthorized use of your blog, account and site, or any other breaches of security. VitalityAdvocates.com will not be liable for any acts or omissions by you, including any damages of any kind incurred as a result of such acts or omissions. 3.9. Your blog and/or site is not named in a manner that misleads your readers into thinking that you are another person or company. For example, your blog’s URL or name is not the name of a person other than yourself or company other than your own. 3.10. You have, in the case of Content that includes computer code, accurately categorized and/or described the type, nature, uses and effects of the materials, whether requested to do so by VitalityAdvocates.com or otherwise. Without limiting any of those representations VitalityAdvocates.com has the right (though not the obligation) to, in VitalityAdvocates.com’s sole discretion (i) refuse or remove any content that, in VitalityAdvocates.com’s reasonable opinion, violates any VitalityAdvocates.com policy, or is in any way harmful or objectionable, or (ii) terminate or deny access to and use of the member site to any individual or entity for any reason, in VitalityAdvocates.com’s sole discretion. VitalityAdvocates.com will have no obligation to provide a refund of any amounts previously paid. 4.4. If content and information is published in blogs and/or universal forums, it means that any person interacting with VitalityAdvocates.com is able to access and use that information. Such information may be associated with your name and/or profile picture. 4.5. While we appreciate customer feedback, VitalityAdvocates.com is not obligated to compensate users for any feedback and/or advice concerning the website. 5.3. You will not engage in unlawful business practices, such as pyramid schemes on VitalityAdvocates.com. 5.10. You will not use VitalityAdvocates.com to do anything unlawful, misleading, malicious, or discriminatory. 5.11. You will not do anything that could disable, overburden, or impair the proper functioning and/or access to VitalityAdvocates.com, such as a denial of service attack. 6.1. All information provided on VitalityAdvocates.com regarding personal information is true and factual. False personal information will not be provided when registering and maintaining your site. In accordance with providing true and factual personal information, you will not create a site for anyone other than yourself without their expressed permission. 6.2. If we disable your account, you will not create another one without our permission. 6.3. You will keep your contact information accurate and up-to-date. 6.4. You will not share your password, (or in the case of developers, your secret key), allow access to your account or engage in any communication that might jeopardize the security of your account or the safety of other users. 6.5. You will get written permission before attempting to transfer your account (including any page or application you administer) to anyone. 6.6. If you select an inappropriate or offensive username for your account, we reserve the right to remove or reclaim said name (such as trademarked names when a user’s name lacks any literary connection or if the name incites violence). 7. Responsibility of Website Visitors. VitalityAdvocates.com has not reviewed, and cannot review, all of the material, including computer software, posted to the Website, and cannot therefore be responsible for that material’s content, use or effects. By operating the Website, VitalityAdvocates.com does not represent or imply that it endorses the material there posted, or that it believes such material to be accurate, useful or non-harmful. You are responsible for taking precautions as necessary to protect yourself and your computer systems from viruses, worms, Trojan horses, and other harmful or destructive content. The Website may temporarily contain content that is offensive, indecent, or otherwise objectionable, as well as content containing technical inaccuracies, typographical mistakes, and other errors. The Website may also contain material that violates the privacy or publicity rights, or infringes the intellectual property and other proprietary rights, of third parties, or the downloading, copying or use of which is subject to additional terms and conditions, stated or unstated. VitalityAdvocates.com disclaims any responsibility for any harm resulting from the use by visitors of the Website, or from any downloading by those visitors of content there posted. While VitalityAdvocates.com promotes a free and diverse open expression of ideas we do so with respect to other people’s rights, and expect you to do the same. 7.1. You will not post content or take any action on VitalityAdvocates.com that infringes or violates someone else’s propriety and/or civil rights or otherwise violates the law. 7.2. As VitalityAdvocates.com asks others to respect its intellectual property rights, it respects the intellectual property rights of others. If you believe that material located on or linked to by VitalityAdvocates.com violates your copyright, you are encouraged to notify VitalityAdvocates.com by providing a Digital Millennium Copyright Act (DMCA) notice. Upon receipt of a valid and complete notice, we will remove the material. 7.3. This Agreement does not transfer from VitalityAdvocates.com to you any VitalityAdvocates.com or third party intellectual property, and all right, title and interest in and to such property will remain (as between the parties) solely with VitalityAdvocates.com. Other trademarks, service marks, graphics and logos used in connection with the Website may be the trademarks of other third parties. Your use of the Website grants you no right or license to reproduce or otherwise use any VitalityAdvocates.com or third-party trademarks. VitalityAdvocates.com will respond to all such notices, including as required or appropriate by removing the infringing material or disabling all links to the infringing material. 7.6. We reserve the right to remove any content or information you post on VitalityAdvocates.com personal websites if we believe that it violates this Agreement. 7.7. VitalityAdvocates.com will terminate a visitor’s access to and use of the Website if, under appropriate circumstances, the visitor is determined to be a repeat infringer of the copyrights or other intellectual property rights of VitalityAdvocates.com or others. In the case of such termination, VitalityAdvocates.com will have no obligation to provide a refund of any amounts previously paid to VitalityAdvocates.com. 7.9. You will not post anyone’s sensitive financial and/or personal identification information anywhere on VitalityAdvocates.com or its affiliate programs. 8. Copyright Claims – Limited Liability Indemnification. As per paragraph 7.2, VitalityAdvocates.com and Vitality Toolbox, LLC endeavors to respect the intellectual property rights of others and comply with all licensing rules of content and technology provided by VitalityAdvocates.com. 8.1. Notice of Infringement. If you receive any notice, legal challenge or information related to perceived or actual copyright infringement arising from images, videos or content on your website, you agree to immediately notify VitalityAdvocates.com, in writing within 5 days. 8.2. If VitalityAdvocates.com is so noticed, VitalityAdvocates.com will remove said content as per paragraph 7.2. 8.3. For content that was posted by subscriber, additional users or visitors of the website, VitalityAdvocates.com makes no indemnity for fines, costs or legal fees, which is the sole responsibility of the subscriber. 9. Payment and Renewal. VitalityAdvocates.com is a paid subscription service including the base membership site package or your choice of upgrade packages or services available on the site (any such services, an “Upgrade”). By selecting a Package or Upgrade Package you agree to pay VitalityAdvocates.com the monthly or annual subscription fees indicated for that service (additional payment terms specifically for VIP services are described below). Payments will be charged on a pre-pay basis on the day you sign up for a Package or Upgrade and will cover the use of that service for a monthly or annual subscription period as indicated. Fees are not refundable. 10. Automatic Renewal. Unless you cancel your subscription on your dashboard’s account page or notify VitalityAdvocates.com before the end of the applicable subscription period that you want to cancel your subscription, your subscription will automatically renew and you authorize us to collect the then-applicable annual or monthly subscription fee for such subscription (as well as any taxes) using any credit card or other payment mechanism we have on record for you. 12. Add-on services. VitalityAdvocates.com provides customization services and add-on features. By purchasing an add-on service or feature, you agree to the respective terms of said service or feature. 13.1. We give you permission to use the share link button so that users can post links or content from your site on VitalityAdvocates.com. 13.2. You give us permission to use and allow others to use such links and content on VitalityAdvocates.com. 13.3. You will not place a share link button or hyper link any VitalityAdvocates.com page containing content that would violate this Agreement. 15. Amendments. We may change this Agreement at any time, if we provide you notice. Any changes will be posted to https://VitalityAdvocates.com Terms of Service page. Any changes to sections relating to payments will be given 30 days-notice. Any changes made for legal or administrative reasons, or to correct inaccuracies, will be made without notice. 16. Termination. The violation of the letter of this agreement, both literal and in sprit, or the creation of any risk, whether legal, technical or otherwise, will result in the termination of access to or interaction with VitalityAdvocates.com. 17. Disputes. Claims or disputes will be resolved in a state or federal court in Oakland County Michigan. The laws of the State of Michigan will govern this Agreement in addition to any claim that may arise between you and VitalityAdvocates.com. If a party introduces a claim against VitalityAdvocates.com related to your actions on VitalityAdvocates.com, you will reimburse and/or hold us harmless from all damages, expenses or losses of any kind. In no event will VitalityAdvocates.com, or its suppliers or licensors, be liable with respect to any subject matter of this agreement under any contract, negligence, strict liability or other legal or equitable theory for: (i) any special, incidental or consequential damages; (ii) the cost of procurement or substitute products or services; (iii) for interruption of use or loss or corruption of data; or (iv) for any amounts that exceed the fees paid by you to VitalityAdvocates.com under this agreement during the twelve (12) month period prior to the cause of action. VitalityAdvocates.com shall have no liability for any failure or delay due to matters beyond their reasonable control. The foregoing shall not apply to the extent prohibited by applicable law. WE DO ENDEAVOR TO KEEP VITALITYADVOCATES.COM BUG, VIRUS, AND MALICIOUS SOFTWARE FREE. WE ALSO STRIVE TO CREATE A SAFE FORUM. HOWEVER, YOU USE THIS SITE AT YOUR OWN RISK. WE PRESENT VITALITYADVOCATES.COM WITHOUT ANY EXPRESSED OR IMPLIED WARRANTIES, INCLUDING BUT NOT LIMITED TO, MERCHANTABILITY, FITNESS FOR A PARTICULAR PURPOSE, AND NON-INFRINGEMENT. WE DO NOT GUARANTEE THAT VITALITYADVOCATES.COM WILL BE SAFE AND SECURE. VITALITYADVOCATES.COM AND VITALITY TOOLBOX LLC IS NOT RESPONSIBLE FOR ACTIONS, CONTENT, INFORMATION, OR DISPLAY OF THIRD PARTIES. YOU RELEASE US FROM ANY CLAIMS OR DAMAGES, KNOWN AND UNKNOWN, ARISING FROM ANY CLAIM AGAINST THIRD PARTIES. NEITHER VITALITYADVOCATES.COM NOR ITS SUPPLIERS OR LICENSORS, MAKES ANY WARRANTY THAT THE WEBSITE WILL BE ERROR FREE OR THAT ACCESS THERETO WILL BE CONTINOUS OR UNINTERRUPTED. YOU UNDERSTAND THAT YOU DOWNLOAD FROM, OR OTHERWISE OBTAIN CONTENT OR SERVICES AT YOUR OWN RISK. 18. Definitions. VitalityAdvocates.com refers to the features and services we make available, including (a) our website at VitalityAdvocates.com and any other VitalityAdvocates.com and Vitality Toolbox, LLC branded or co-sponsored websites (including sub-domains, international versions, widgets, and mobile versions); (b) our Platform; (c) social plugins; and (d) other media software, devices, or networks now existing or later developed. 20.6. You will comply with all applicable laws when using or accessing VitalityAdvocates.com. Date of Last Revision: April 9,2016. 1. A user account will be created for you for your website plus as a community member in Vitality Advocates. 2. A website will be created and will start with a Pre-made "Coming Soon" page. 3. You will receive an email when you can access your site (usually within 5 minute)s. Make sure that you whitelist the domain vitalityadvocates.com to make sure that emails from us do not go to your junk folder. 4. The first thing you will do when you access your new site is to select your website package and create your payment subscription. 5. You will then be able to create your website using Elementor Pro page builder and templates. Many how-to videos available to step you through the process. 6. To get you up and running fast, you will find many features have been pre-setup for you. If you have questions that you need answered before continuing with a Vitality Advocates website, click on the following contact link: Contact Use. You can save this form to continue at a later time. Did you know that a moment of gratitude a day can change your life! Research shows that the simple act of gratitude has a profoundly positive impact on your quality of life, your relationships and your overall perspective of the world around you. To help you experience the benefits of gratitude, you are invited to participate in a free 30 Day Gratitude Journey sponsored by Vitality AdvocatesTM. Based on your selected time preference, you will receive an email each morning or evening for 30 days that includes an inspirational image and quote with a link to your personal and private gratitude journal. You can express your moment of gratitude in your journal as a single word, phrase or sentence. 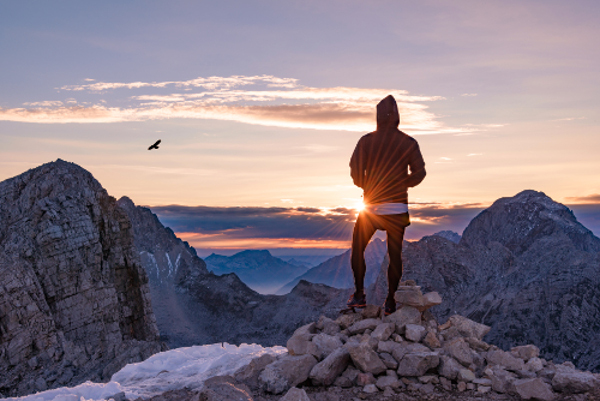 This process will help you establish a habit of gratitude from which you’ll see for yourself that a moment of gratitude will lift and refresh your spirit and enhance your perspective on life. Regularly focusing on the things you’re grateful for provides a fabric of appreciation and positive energy that you can carry throughout the day to reduce the impact of life’s little (or big ) annoyances. At the end of your journey, you’ll have compiled a list of many things that bring you joy and are worthy of gratitude. You can access your personal gratitude list at any time in your profile. 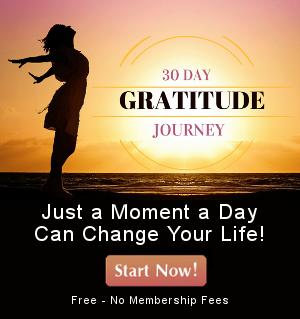 Would you like to register for the 30 Day Gratitude Journey? Today is the first day of your Gratitude Journey. You can enter your gratitude entry below. After today, you will receive your daily gratitude inspiration, quote and journal entry in your inbox. Since some people prefer to make their gratitude reflections in the morning while others prefer the evening, we are providing you with a choice. Please select your preference for when you would like to receive your daily Gratitude Journey email in your inbox? Today I am grateful for . . .